Speech notes of a presentation to NZNO Southern Regional Convention at the Otago Golf Club, Balmacewan, Dunedin, 28 March 2018. Tihei mauri ora! Te mea tuatahi, ka tū ahau ki te tautoko i ngā mihi ki te kaihanga. Firstly I stand to support the acknowledgement of the creator. Kei te mihi hoki ahau ki ngā uri whakaheke nā Tahu-pōtiki, te tino tipuna, me ō rātou wāhi tapu katoa. I also acknowledge the descendants of Tahu-pōtiki, the great ancestor of Ngai Tahu, and all their sacred places. Nō reira, e ngā mana e ngā reo, e ngā karangaranga maha, tēnā koutou. So to all the authorities, all voices and the many affiliations, greetings. As I speak at meetings around the country, I often talk about my connections to this place. It was here, in Ōtepoti/Dunedin, that my ancestors arrived from Scotland back in 1849, aboard the Cornwall. Behind me I know that Mount Cargill, Kapukataumahaka, is looking down on us, as it always has. Out there beyond the trees, I see my old high school, where I returned last year for the school centenary. And over the ridge line, I know that Ōwheo, the water of Leith, winds its way to the sea. It’s wonderful to be back home, on my tūrangawaewae, the home where my feet belong. The topic I’ve been asked to speak on today is, “The impact of social media on NZNO members, delegates and on NZNO’s reputation”. It’s a sensitive topic. It is also very large. My talk will not be a definitive, or comprehensive account of the impact of social media. 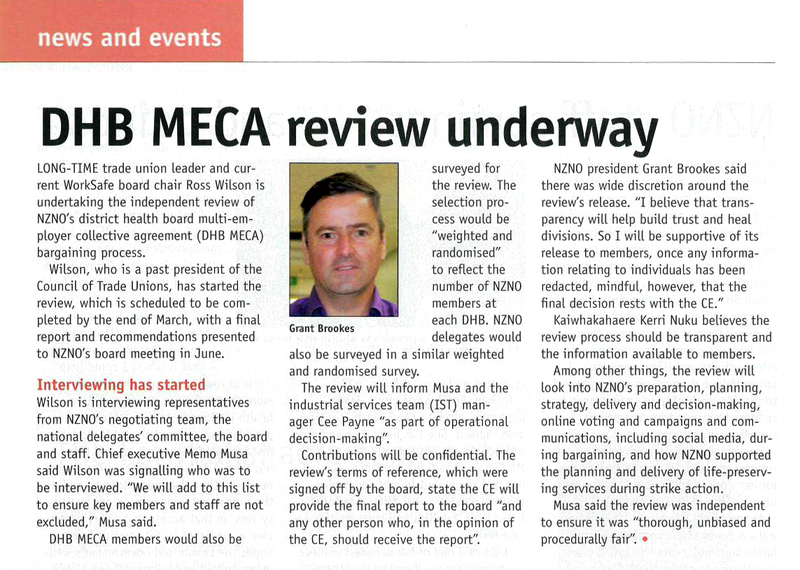 As you may be aware, a review of the DHB MECA bargaining process and supporting campaigns is currently being conducted by former CTU President Ross Wilson. The terms of reference for the review direct him to “Enquire into and comment on NZNO’s… processes for communications (internal and external) including the use of social media”. We keenly await his findings, which are due to be delivered to the NZNO Board in June. After that, we will be in a better position to evaluate thoroughly the impact of social media on NZNO members, delegates and on NZNO’s reputation. Even this time next week, I would be better placed. At the CTU Organising Conference in Auckland on Wednesday, there will be an NZNO presentation on, “Lessons learned from the major state sector industrial campaigns of 2018”. No doubt this will cover the impact of social media, as well. In place of a definitive, or comprehensive account, what I have to offer now are just some interim personal observations, based on a few examples of social media impacts, followed by a brief introduction to NZNO’s new publication, “Social media and the nursing profession: a guide to maintain professionalism online for nurses and nursing students 2019”. So what are we talking about, when we speak of social media? It’s a truism to say that social media is rapidly evolving. It’s moving so fast, in fact, that some of the content in NZNO’s new guideline, updated during 2018 and published just last month, is already starting to become dated. Part of this rapid evolution is a blurring of the distinction between social media and traditional news media. Online newspapers such as Stuff are increasingly integrating user-generated content, through a comments area, through reporting on social media posts, through embedding of tweets and Facebook Live videos directly in their articles and through an entire section dedicated to content submitted by readers, called “Stuff Nation”. For this reason, my talk will also touch on the impact of the news media. Let me start with an immediate example – one that’s current, and close to home. Here are a couple of photos taken earlier this month in Ōamaru. You may recognise some of the people, and what the photos depict. Last month, the Otago Daily Times obtained a copy of a confidential “proposal of change” document distributed to Ōamaru Hospital staff, which included a proposed staffing restructure. The proposed restructure would impact seriously on NZNO members. All current nursing positions would be disestablished. Those currently employed to fill the 35.3 full-time equivalent nursing roles would be forced to reapply for a reduced number of jobs, adding up to just 20.5 FTE. Reflecting on the theme of today’s convention, “Nurses A Voice to Lead – Health for All”, the proposal for change could also impact on access to healthcare for the rural population inthe Waitaki District. The photo on the lower left of the slide above comes from an ODT story about one of these meetings, where strong views were expressed about the proposal to cut nursing jobs. The one on the upper right, courtesy of Oamaru Captured, shows a march to support jobs and services. So here we see how social media is influencing practice environments and job security for NZNO members. “The Waitaki Community deserves the right to ensure ongoing service provision at the Hospital now and well into the future. In its first week, the petition has been signed by over 400 people – or around one in 30 of Ōamaru’s resident population. So overall, I think the primary impact of social media on NZNO members and delegates in this instance has been to rapidly mobilise strong public support. It’s a good example of what’s known as “online-to-offline” activism, where the power of social media is harnessed to generate measurable effects in the community – in this case, to the benefit of NZNO members and delegates. But this is not the only prominent example from this region over the last year. Here are two photos taken in the Octagon, on International Nurses Day 2018. They depict one of 15 rallies held around New Zealand that day. As reported in the ODT these rallies, too, were organised through social media: “A social media site has transformed into a nationwide nurses movement which will stage rallies across New Zealand this weekend”, says this article, which also carries an interview with Dunedin Hospital delegate Anne Daniels (pictured, on the right). The site in question was the the “New Zealand, please hear our voice” Facebook group, created by two anonymous nurses after the first DHB offer was rejected. Within a fortnight, it had grown to 37,000 members. The effect of this large social media-led campaign is probably impossible to quantify, in what was a period of intense and multi-faceted activity by and for NZNO members. But two weeks after these rallies, the DHBs lifted their pay offer to members from 6% over three years to 9.3–15.9% over 26 months. I think it’s undeniable that the impact on NZNO members was significant and positive. But to say that the impact of social media hasn’t been universally positive would be an understatement. I won’t dwell on this point, as I’m sure most of us who are on Facebook have plentiful first-hand experience of negative impacts, both on ourselves as members and on the reputation of our organisation. But I will refer to the end of year editorial in Kai Tiaki. The abuse that was rained down via social media fell, above all, upon NZNO representatives in the DHB MECA negotiating team and campaign leadership. And I want to acknowledge in particular the impact this had on your local delegate, Robyn Hewlett. In July last year, as the manifold impacts of the protracted bargaining started to mount, I called a special meeting of the Board to consider whether some organisational guidance from the governance leadership might be required. In the event, the meeting took place in August, just after the MECA offer was ratified. One of the issues we discussedwas the impact of social media on NZNO negotiators. Afterwards, a statement penned by Vice-President Rosemary Minto was published on the official NZNO Facebook page. It is hard to say why NZNO experienced such a negative impact, where other professional groups taking large scale industrial action over the last year, such as doctors and teachers, did not. One difference between NZNO and these other groups is that the others mounted high profile media campaigns, starting well before bargaining commenced, or set up their own officially moderated Facebook groups for union members to engage in online-to-offline activism. Here on the left we see the primary teachers union launching its campaign, and on the right the creation of the secondary teachers union Facebook group, in each case six or more months prior to the start of their negotiations. When NZNO did embark on our digital campaign on 26 March 2018, under the umbrella of #HealthNeedsNursing, it immediately generated strong positive effects for NZNO members and delegates, and for NZNO’s reputation. Although it did not utilise Facebook groups, #HealthNeedsNursing was a cross-platform, multi-media campaign, deploying text, images and video over Instagram, Facebook Pages, YouTube and Messenger. This two-page infographic shows just how great the impact of our social media was. I have hard copies of the “Campaign at a Glance” document here, for you to take away. Again showing the power of online-to-offline campaigning, note the three dozen rallies which were held around the country in April. Organised through Facebook Events as well as through workplaces, they involved thousands of NZNO members and supporters – even more than the numbers who took part in the #HearOurVoices marches. And of course there was integration with the historic DHB strike on 12 July. Overall, this social media activity certainly contributed to positive impacts on DHB members achievedthrough bargaining. So far, I have offered observations and examples where social media has impacted on NZNO members collectively. I will conclude by looking at individual impacts. Rosemary Minto’s statement abovementions the Nursing Council of NZ Code of Conduct. Patient confidentiality remains a primary focus of the new NZNO social media Guideline. But speaking with NZNO Professional Nurse Advisors in different parts of the country, new trends appear to be emerging. Anecdotally, referrals to Nursing Council for individuals are now less frequentfor breaches of patient confidentiality, and more frequentfor social media breaches of these two standards – “treat colleagues with respect” and “maintain high standards of behaviour in your relationship with your employer”. There is little in the way of hard data on this, as yet. The latest published Annual Report from the Nursing Council is now two years old. And I’m told that NZNO’s data collection systems, through the Member Support Centre, are not well set up to capture this emerging trend. Calls related to social media issues could be coded variously by MSC as an “Industrial – Disciplinary” matter, a “Professional –Media” issue, or something else. But there appears to be one such case, here in this post in the “hear our voice” group in January. “I’ve just received a message from a member who’s been reported to Nursing Council… due to being overtly savage online regarding their employer”. I hope these personal observations and examples of social media impacts have helped to stimulate your thinking. I will leave you with one piece of advice. To avoid the negative impacts of social media for yourself and NZNO, and maximise the positive impacts, the best thing you can do is refresh your knowledge of these two guidelines. Photo courtesy of Kai Tiaki Nursing New Zealand. Āta mārie, tēnei te mihi ki a koutou. Good morning, greetings to you. Ko wai ahau? Ko Kapukataumahaka tōku maunga, ko Ōwheo tōku awa, ko Cornwall tōku waka. Ko te Tāngata Tiriti tōku iwi, ko Don rāua ko Helen ōku mātua. Ko Grant Brookes ahau. Nō reira, tēnā koutou katoa. Who am I? The place I come from looks up at a mountain called Kapukataumahaka, or Mount Cargill, and sits beside a river called Ōwheo, the Water of Leith. My ancestors arrived there, in Dunedin, aboard a waka, or ship called The Cornwall. I belong to the People of the Treaty, the people who reside here under the agreement first signed at Waitangi in 1840. My parents are Don and Helen, and I am Grant Brookes. The topic I have been given to speak about is, “Where to from here? Into the future, the path forward, what is the role for migrant nurses in NZNO?”. Let’s begin with definitions. What is this group, the migrant nurses in NZNO? Who are they? The answer may surprise you. We don’t entirely know. The NZNO membership database contains a field recording a member’s “country of first qualification”. In theory, therefore, the migrant nurses in NZNO should be clearly identifiable. They would be the members who ticked a box other than “New Zealand” in their membership application, in response to this question. However, in speaking with the NZNO Membership Department in preparation for this talk, I learnt that it’s not so simple. Firstly, this field was added to the database only around four years ago. For members who joined prior to that, there is no record of where they first qualified. And I was told that anecdotally, the data is not reliable, as many members who have joined since 2015 left this field blank on their membership form, or filled it out incorrectly. But when we speak of migrant nurses (and of internationally qualified health workers who may not be working as nurses, the other group covered by this conference), what we’re often thinking of are people who share particular cultural backgrounds – backgrounds other than New Zealand European or New Zealand Māori. Research suggests that the experiences of NZNO members in these minority groups (including experiences of racism) are similar, regardless of whether the person first qualified as a nurse in New Zealand or overseas. In other words, what we’re talking about is ethnicity. And with your permission, I would like to focus on this concept, which thankfully is captured by NZNO in a time-series data set which is more robust. Do you like data? I do, as you may have guessed. So if you’re not a fan, please indulge me for a couple of minutes as I present some charts showing the changing ethnic makeup of our membership over the last ten years. Just one final word about data quality – up until 2015, ethnicity categories in the NZNO membership database were less specific. So, for example, members belonging to one of the many Asian ethnic groups were described as either Chinese, Indian or “Other Asian”. The NZNO Board requested refinements to the reporting categories in 2016, to make the growing diversity of our membership more visible. You will see this in the later charts. Ethnicity data captured in the NZNO database is now aligned with the fields recorded by the Nursing Council, although it’s still not perfect and anecdotal reports suggest a member’s ethnicity sometimes defaults incorrectly to NZ European. So based on what we have, this was the picture at 31 December 2008. Our membership was largely made up of people identifying as New Zealand European, with a significant Māori group. There was also a visible group of “Other Europeans”, reflecting the traditional trickle of migrant nurses from places like the UK and Australia. Click to play the video below and watch how it changes, year by year. In 2010, the “Other Asian” group started to overtake “Other European”, as the primary source countries for IQNs started to change. The trend then accelerated. If current trends continue, New Zealand Europeans like me will be a minority of NZNO members by 2025. It is worth mentioning in passing that there hasn’t been any similar transformation of the NZNO staff. There are almost 130 people employed by NZNO, in a variety of roles. But aside from our Chief Executive, there are still no IQNs of non-European ethnicity among them. So that’s the picture from the last ten years. But if you go back further, the demographic transformation of the NZNO membership appears starker still. I became a member of NZNO in 2002. Back then, the organisation looked like this. As you can see, the NZNO which I joined was largely monocultural, at least as far as our membership base was concerned. You might also note that the opening up of this monoculturalism has come through the declining proportion of members identifying as New Zealand European. Māori membership has not declined. The proportion of members who are tāngata whenua, or people of the land, and the proportion who are tauiwi, or more recent arrivals residing here by virtue of Te Tiriti o Waitangi, is virtually unchanged through this period. The relationship between these two groups underpins the bicultural foundation of our organisation – in accordance with the bicultural foundation of our nursing profession, and indeed of our nation. Kerri Nuku will speak more about this next. If this is the story so far, what is the role for IQNs and migrant health workers in NZNO, into the future? Let me first flip that question. 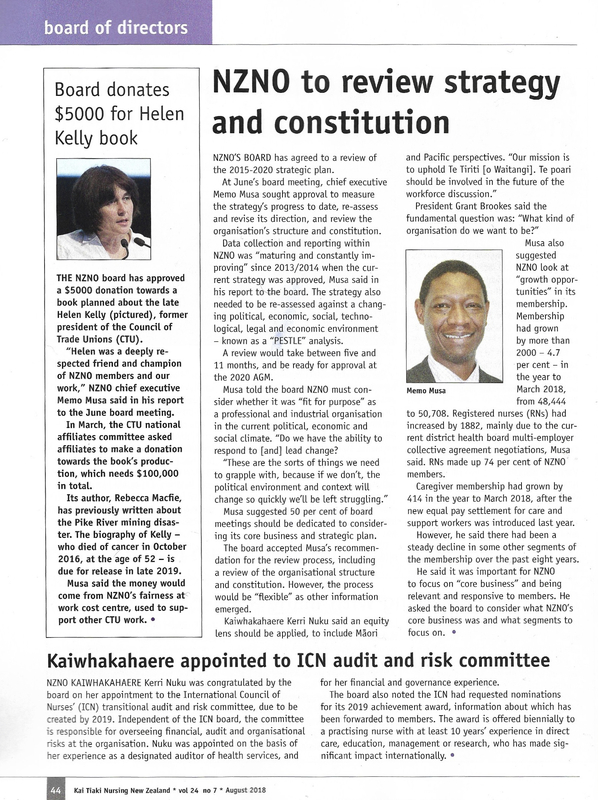 What is my role, as Co-chair of the NZNO Board, for IQNs and migrant health workers in NZNO? I know that as a New Zealand European, citizen and NZRN, I automatically benefit from a system of privilege, whether I like it or not. My role for IQNs and migrant health workers in NZNO is to use that privilege to make space at the top table for people without it, like you. Your role is quite simply to take your place in the leadership of NZNO – as increasing numbers of you are already doing. I would like to briefly showcase just a few of the leading roles being filled by migrant nurses today. Some of these people, you will probably recognise. Victoria Santos is an IQN from the Philippines. She also holds a senior leadership position in the governance of NZNO. Victoria sits on the Membership Committee, the national body which advises the NZNO Board of Directors on the views and needs of the diverse membership. The Membership Committee also helps to carry out delegated work such as drafting the constitutional changes which will this year see voting on NZNO policies and rules opened up to everyone, though an online “one member, one vote” system. Jed Montayre is also from the Philippines. Within NZNO, Jed is an elected member of the National Committees of Gerontology Section and also the Nursing Research Section. He has served on the abstracts committee which selected the papers for presentation at the NZNO Annual Conference. Here, he is pictured receiving the award as joint winner of the NZNO Young Nurse of the Year in 2016. One of the three abstracts chosen for last year’s NZNO Annual Conference was on “The Experience of Migrant Health Workers in New Zealand”. It was jointly presented by three Filipinos – Joey Domdom, Judith Salamat and Mayie Pagalilauan – in conjunction with Toga Katyamaenza, an IQN from Zimbabwe. Here they are pictured with IQN and former NZNO Board member Monina Hernandez, who will speak to us later this morning. Shamim Chagani is an IQN from Pakistan, and an elected member of the National Committee for NZNO Nurse Managers New Zealand. She is also the editor of the Nurse Managers’ newsletter, Te Wheke, a Māori title which means, “The Octopus”. But IQNs are not just demonstrating professional leadership within NZNO. This poster features Ebson Abraham, an IQN from India. The poster was produced by the NZNO Tai Tokerau Regional Council for International Nurses Day last year, to celebrate local NZNO leadership in Northland. The writing is probably too small for you to read, but it says Ebson was a workplace delegate at Cairnfield House Rest Home in Whangarei, where “he took responsibility for NZNO services, promoting the union movement from scratch and then constructed a movement that is measurable by the increase of NZNO membership density up to 80% that eventually built a strong force for change. This wave became a pillar… for NZNO bargaining in 2016/17 with an effective settlement of a collective agreement in 2017”. As an aside, there is a widespread assumption among New Zealanders that union membership and activism are somehow foreign to the cultural values in the primary source countries for IQNs today. The diversity clearly displayed on marches and rallies by DHB nurses last year should help to dispel that stereotype. But so would greater knowledge of overseas nursing unions, which are growing under very difficult conditions and waging struggles on a scale and intensity which make our DHB strike look timid. A case in point is the United Nurses Association of India. It was formed in the southern state of Kerala in 2011, in response to the suicide of a nurse who had been bullied by her managers. It now numbers over half a million members. Months of protests and strikes in 2017 and 2018 won agreements on pay rises for around 80,000 nurses in private hospitals. At one hospital in Kerala, nurses remained on strike and picketed outside the facility daily, for over a year. The spectacular rise of the United Nurses Association is an amazing story. I hope to meet leaders of that union for the first time in July at the annual meeting of our international union federation, Global Nurses United. But it’s by no means an isolated case. Nurses in the Philippines have been organising for decades – again under very difficult conditions – through unions including the Alliance of Health Workers and more recently through Filipino Nurses United. Last year, Kerri Nuku and I attended 61st annual general meeting of the Fijian Nursing Association. FNA has been active as a Pacific nursing union since 1977, including campaigning for workers’ rights under military rule, and so on. Returning to the slides, the last two IQN leaders in NZNO I wish to showcase highlight the need to avoid assumptions when it comes to migrant nurses. Current Board member Eseta Finau occupies the highest leadership role in NZNO of any IQN. She will talk to us shortly about that role. Despite also being the most Tongan person I know, however, she actually qualified as a nurse in Australia. Gidday cobber! And then there are NZNO leaders who you might not pick as IQNs from their appearance. Debbie O’Donoghue is a former NZNO Board member who now serves on the national committee of NZNO Nurse Managers New Zealand. She is also an IQN, from the UK. One of the ways that any member can influence NZNO’s direction from the bottom up is by responding to consultation requests. This is where staff from the NZNO policy and research team seek member input, in order to determine NZNO’s position on a wide range of issues. They do this by emailing all member groups, including Regional Councils, to ask for feedback. They also post the requests on the NZNO website, under the menu “Get Involved > Consultation”. If migrant nurses are not getting the consultation requests by email, from a member group, you can sign up on the website to be notified each time a new one comes out. Here is a recent request, asking for input to shape NZNO’s view about the changes to temporary work visas for migrants currently being proposed by the government. Unfortunately, the deadline has passed for people to respond to this request, although if anyone is interested in making an individual submission to the government, you can do it via the MBIE website until Monday, at the address on screen. So these are some of the ways that migrant nurses can take up your role as leaders of NZNO and use your power to make a difference. But as the title of Monina Hernandez’s presentation on today’s programme reminds us, the role for migrant nurses in NZNO is not just about “making a difference”. It’s also about “being yourself”. I will end on this point. Coming up before morning tea is Abel Smith’s presentation, “An introduction to the Pacific Nursing Section”. The PNS is one of NZNO’s 20 colleges and sections. I am really looking forward to it because for me, this group epitomises what it means for ethnic minority members to be themselves while also making a difference. NZNO sections and colleges are groups of members with a focus on a specific field of nursing. The colleges are groups relating to a specific clinical specialty, while the sections are groups representing a role or membership classification, such as those sharing a specific culture or cultures. Formed in 2008, the Pacific Nursing Section was the last NZNO section to be established before a moratorium was placed on the formation of new sections in 2011. The NZNO Constitution was amended last year, through a remit submitted to the NZNO AGM by the Greater Auckland Regional Council, to lift the moratorium and allow the creation of new colleges and sections. The rationale provided in support of the remit noted that: “NZNO structures need to be flexible enough to respond to the changing reality”. And we’ve seen in the pie charts the changing reality of NZNO membership. The remit rationale added: “Various membership and role classification groups exist without a corresponding NZNO structure to date. Examples include… internationally qualified nurses”. I will now hand over to Kerri Nuku. Because we will be back as part of the discussion panel after lunch, and because I have used up all of my available time, I would ask that you save any questions until then. Titiro ki muri kia whakatika ā mua. Look to the past to proceed with the future. I CAME across this proverb last month at Te Matatini, the national kapa haka championships in Wellington. It summed up for me our task as we prepare to update and replace NZNO’s five-year strategic plan, which expires next year. The process approved by the board will involve input from external stakeholders, NZNO staff and members. Looking back, and thinking about the future, gives us all a chance to re-focus on the big questions for NZNO. Who are we here for? What are we hoping to achieve? How will we get there? What’s going on in our environment – political, economic, social/cultural, technological, legal and environmental – that we will need to respond to? Much has changed since delegates at the 2015 NZNO annual general meeting voted to approve the current strategic plan. Back then, as chief executive Memo Musa reminded us, union membership was declining. Law changes had made it harder for unions to operate, and union influence was dwindling. An NZNO strategy stressing nursing professionalism fitted with the times. Fast forward to 2019 – anti-union laws have been reversed, and the trend of declining union membership has also turned around. Union engagement with employers and government is stronger. Health funding is no longer falling. There’s also much to learn from last year’s unprecedented DHB MECA campaign. The board has also agreed in principle on a review of our operational structures, to make sure they’re suitable for implementing the new strategy. And while no decision has been made, we have discussed whether the NZNO constitution – which spells out who has the power to do what in NZNO, and members’ rights and responsibilities – might need to be reviewed, as well. In my view, the answer to the first big question, “Who are we here for?”, is that NZNO is here, above all, for the members, and we must keep members at the centre of our planning. If we focus on supporting and empowering members, then our strategic goals and the ways to achieve them will become clear. Members see the impacts of health and social policies, and belong to communities who experience impacts, too. Supporting members means our strategic goals should include political changes. All of us are unionised workers and health professionals. Focusing on members solves the conundrum of whether to stress “industrial or professional” strategies. At all times, we are both. And nurses and midwives are required to practise in a culturally safe manner, under the Treaty of Waitangi/Te Tiriti o Waitangi. Supporting members means strengthening biculturalism. Such a member-centric strategic plan might suit an NZNO structure where more authority and resources are devolved to our volunteer member-leaders. HERE COMES The Sun – the classic Beatles track off the 1969 Abbey Road album – was one of the first songs that our son, aged two and a half, learned to sing. Memories of walking to feed the ducks in the summer of 2007/8, accompanied by strains of, “Sun, sun, sun, here it comes!” still warm my heart. This George Harrison composition could have been a glib, throwaway ditty. I think its longevity and power stem partly from its invocation of a “long, cold, lonely winter” which has lasted for what “feels like years”. Shortly after its release at the end of the 1960s – that decade of struggle – brilliant cover versions appeared, by feminist civil-rights singer Nina Simone and rebel reggae artist Peter Tosh. They enriched the meaning of lines like, “I feel that ice is slowly melting”. Patterns of injustice long frozen were starting to shift. And so, as summer 2018/19 arrives in Aotearoa, there are signs the long, cold winter – for nursing and for the people we care for – is also coming to an end. The ice has been cracked by passion, courage and the collective action of NZNO members. Nine years of underfunding ended in May with this year’s Budget. It was our campaigning, together with others, which made health the number one issue for voters and a top priority for the incoming government. Our escalating protests and strikes this year were unprecedented. Our demand to bring back the warmth into health has been game-changing. We didn’t win everything we need to rebuild our health system, but I can see rays of sunlight. Over the last couple of months, I’ve helped assess and approve each DHB’s plans for their share of the 500 new nursing positions created by our campaign. And I’ve felt the warmth returning to our profession. Meanwhile, the health minister will be looking at options for providing employment and training for all nursing and midwifery graduates – delivered under the new Safe Staffing Accord. I see new buildings, new services, new initiatives for our peoples, and I have hope. It will take more struggle to clear away all the dark clouds over our public health system – and the deeper chill still lying across the rest of the sector. But as our courage and passion spreads, so, too, do the cracks in the ice. In November, the first-ever collective action by NZNO members at Ngāti Porou Hauora confronted historic injustices facing Māori and iwi health providers. Trying to survive on meagre government funding, these providers pay nurses around 25 per cent less than those working for DHBs; some are also having to cut services to survive. And December saw members at Family Planning vote to strike for the first time. But before we take up the struggle again, it’s time to celebrate. Summer is here. Let’s make it a good one. Whether you’re working through, or have leave approved, I hope you are all able to enjoy some time in the sun with your loved ones. I will be. (First published in the December/January issue of Kai Tiaki Nursing New Zealand. Reposted with permission). Where are the Pacific nursing voices? Former Cook Islands health secretary Elizabeth Iro (centre) received a ceremonial welcome home at the start of the 19th South Pacific Nurses Forum, where the NZNO delegation included (left to right) president Grant Brookes, Pacific Nurses Section chair ‘Eseta Finau, kaiwhakahaere Kerri Nuku and kaumātua Keelan Ransfield. The relationship that world health and nursing bodies have with the Pacific came under the spotlight at the South Pacific Nurses Forum. Former Cook Islands health secretary Elizabeth Iro received a ceremonial welcome home at the start of the 19th South Pacific Nurses Forum (SPNF), held in the Cook Islands capital, Avarua, in October. Her 2017 appointment to the re-established role of chief nursing officer at the World Health Organization (WHO) in Geneva, followed this year by the selection of Isabelle Skinner, of Australia, to head the International Council of Nurses (ICN), has brought the global institutions into closer contact with Pacific nursing. The WHO, ICN and the International Confederation of Midwives (ICM) were all represented at the forum. Debates over their relationship with the Pacific arose from the outset. These debates took centre stage during the half-day biennial general meeting (BGM) of SPNF member organisations, where NZNO was represented by kaiwhakahaere Kerri Nuku, Pacific Nurses Section chair ‘Eseta Finau and myself. They were also heard in the joint meeting with South Pacific chief nursing and midwifery officers which ended the 19th SPNF. Concerns were already growing ahead of the forum over a proposed Pacific launch of the global Nursing Now campaign.Nursing Now is a three-year campaign to raise the status and profile of nursing. Although run in collaboration with ICN and WHO, it is a programme of the Burdett Trust for Nursing in the United Kingdom (UK), based on a report by members of the House of Lords and the House of Commons in London. Some SPNF delegates felt there had been insufficient information and consultation with member organisations to allow them to endorse Nursing Now. Others asked where the voices of the indigenous nurses of the Pacific were reflected in the campaign. For these reasons, NZNO decided to abstain from the launch. The SPNF BGM later resolved to approach the board of Nursing Now to recommend that two indigenous representatives be appointed to the board. Questions were also raised of the WHO, about why the nursing advisor role in their western Pacific regional office in Suva had been vacant since 2013. The joint meeting with chief nursing and midwifery officers agreed to write to the WHO South Pacific representative, seeking the re-establishment of this position. (First published in Kai Tiaki Nursing New Zealand. Reposted with permission).